Pru Harris is captain of a day cruise ship in the San Francisco Bay area. Since her parents died when she was nineteen, Pru has been somewhat of a loner. After she moves into her new apartment, she meets a few people who quickly welcome her into their circle. One of those people is Finn O’Riley, the owner of the pub next door. It doesn’t take long for Pru to find it difficult to think of him as only a friend. After all, he is a hottie and a really nice guy. She wants only the best for Finn, so she makes a wish for him when throwing a coin into the courtyard fountain. Unbeknownst to her, Pru gets more than she bargains for! 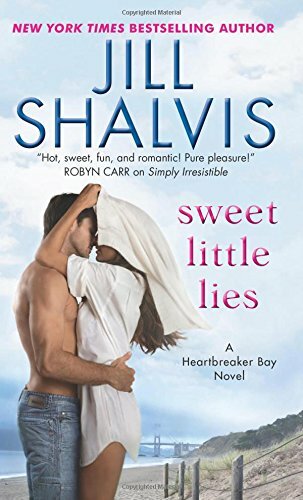 Sweet Little Lies is the first of a new series and a terrific contemporary romance! It contains Shalvis’s trademark snappy dialogue and characters you fall in love with set in the big, beautiful city of San Francisco. I absolutely love Pru. She is such a selfless person that you can’t help but root for her. The fact that she’s never had a really close relationship fuels her insecurity that she might be unlovable. Oh, how my heart went out to her. It’s not hard for readers to fall in love with Finn. He owns O’Riley’s with his younger brother, Sean. Finn raised Sean after their father’s death, and he gave up a lot in order to do so. Finn is responsible and steadfast, while Sean is carefree and easygoing. Finn is the kind of guy you can rely on and wouldn’t hesitate to give you the shirt off his back. It’s no wonder Pru makes a wish for him! I also love the close group of friends. They are so incredibly likeable and funny that, at times, I was reminded of one of my favorite TV shows, Friends. I look forward to their stories in upcoming books. Adding to the humor is the homeless Old Guy and Pru’s neighbor, Mrs. Winslow. Oh my goodness, I found myself laughing out loud repeatedly! (Side note: I read much of this book while my family was on vacation. My husband did a lot of driving, so of course, I read. I lost track of how many times I received funny looks from him when I busted out laughing.) Throw in a cute mutt named Thor, a crazy game of darts, and perfectly worded hashtag epigraphs with each chapter, and you’ve got yourself a winner. Don’t miss out on this one! You've made me even more excited to read this one, Andrea! You know how much I enjoy a story that makes me laugh and the cute mutt is a bonus I'm sure to love. Thanks! I love to laugh when I read, too, PJ. And Thor is adorable. I hope you enjoy it! I don't know how Jill keeps turning out such entertaining stories! I don't know either, Cheryl, but I hope she continues to do so! Jill is on my auto buy list. I absolutely love humor in books. Jill delivers that along with such great characters and stories. So many of her books are come books I have reread. So excited for this new Series. Thanks for the great review. I couldn't agree more, Trish. I hope you enjoy Heartbreaker Bay! I was so excited to pick this up at the library today! Great review and I can't wait to dig in! I love humor in life, so like it when I read. Jill is a funny lady. Her blog is a hoot. I am glad to see I am not the only one to read while riding in a car. Why waste all that perfect time to catch up on all those good books I want to read. 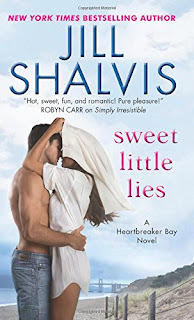 Jill Shalvis always has interesting characters. I look forward to meeting these.